One of the best things about prefab steel buildings is that it’s much simpler to renovate these structures than any other types of buildings. While it will obviously be important to get the right specifications, wants and needs correct the first time, you can take a bit of comfort in knowing that these structures can be much more easily renovated than other kinds of buildings. There are always going to be additions that you might have thought of too late, or your needs have changed a lot since you first put up the building. Either way, renovating your steel structure is something that you’ll be able to have done in much less time and for much less money than renovating other kinds of buildings. Think about the way that steel buildings are put together for a better understanding of what makes it such a better option. Here are just a few of the things that you may want to renovate later on down the line in your prefab steel building. Over time, your structure’s roof might see some damage and eventually need to be repaired or completely replaced. This is one of the most common fixes for any structure, not just steel buildings. This is the part of your building that will experience the most impact and while steel is a quite durable material that can generally stand up to all kinds of weather and conditions, your roof is likely going to be the first thing that will need fixing or replacing on your structure. During your roofing fix, you can also put extra thought into the kind of roof you want to use. There are a plethora of roofing options that go perfectly with prefab steel buildings, and you should explore various options that might work better for your needs and your budget. Depending on what you’re using your structure for, you might find yourself in need of some more space later on down the line. Adding more room to your prefab steel structure is something that will be much easier to do than for a structure made from wood or concrete, just due to the fact that these materials have to be demolished and cleared in order to add more room to the structure at all. With prefab steel, you remove one part of the steel garage building without too much in the way of large scale demolition and using simple DIY methods to create additional space. 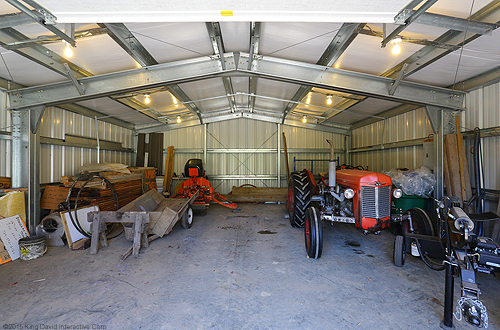 If you’re using your steel building for something like storage, having built-in features like shelving and storage rooms will be of the utmost importance. Consider that ways those features might make your structure that much more functional to use by adding them in, and go from there. You might not be doing much in the way of taking down the structure, but adding in these extra features is something that takes time and resources – and at least some type of rearranging as far as the layout of the structure is concerned.